Screw pine is a plant, which falls under the Pandanus genus. It is monocot and not a pine. Screw Pine is a generic name for several varieties of trees that are closely related, but none of which is a pine tree at all. It is derived from the word Pandan and is derived from an Indonesian name of a tree called Pandan, commonly known as screw pine and falls under pandanaceae family. They look like palm trees, with long thick, dark green leathery leaves, shaped like swords. Some screw pines are cultivated for their fruit, which are edible, some for flowers and fragrant leaves. Screw pine tree can be anywhere between 3 to 65 feet tall. Screw pines grow near the seashore and water bodies. It requires plenty of water and it can withstand drought and salty conditions. It can grow fast if it receives plenty of water. Most of them grow horizontally than vertically. Screw pine has exceptional capacity for the protection of the banks of rivers and canals from erosion. Its fibrous root system helps to hold the alluvial soil intact and maintain the water-holding capacity of the soil. Screw pine provides great refuge for a number of organisms, especially fish. Screw pine is ecologically considered a keystone species, which is a must for the ecological balance of this area. Screw pine mat weaving is an ancient craft, which is more than 800 years old, now a days craft have been diversified from mere mat weaving to plenty of daily utility items. 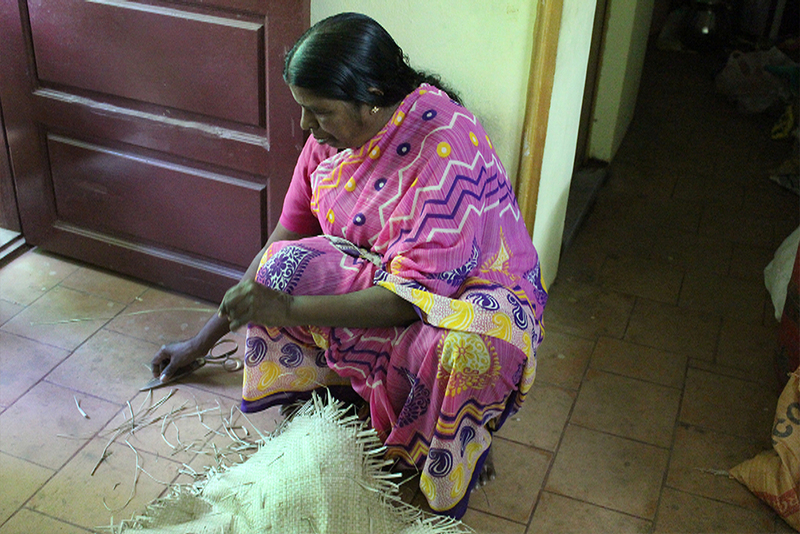 Artisans are given training in developing new designs. 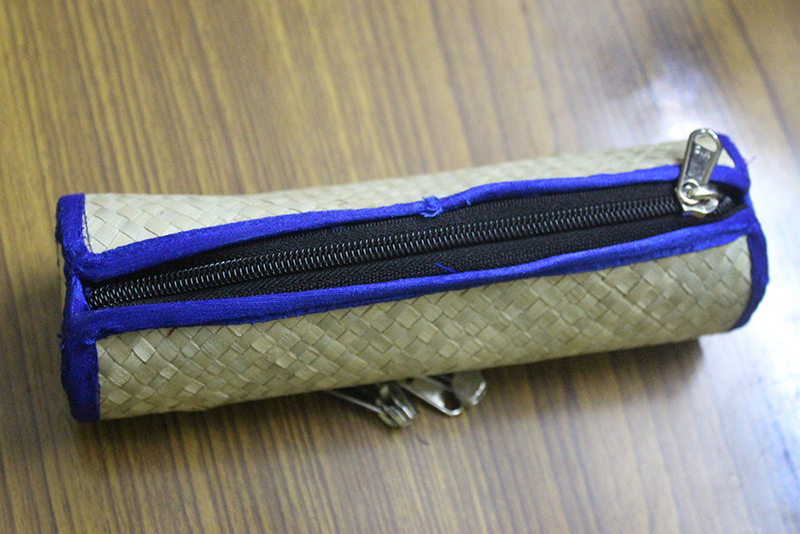 Besides bed mats, the artisans are now making products like vanity bags, carry bags, wastepaper basket, laundry boxes, newspaper holder, files, interior decoration items etc. Government is also providing training to artisans and helping them in promoting this craft. They are encouraged to attend various exhibitions around the country. 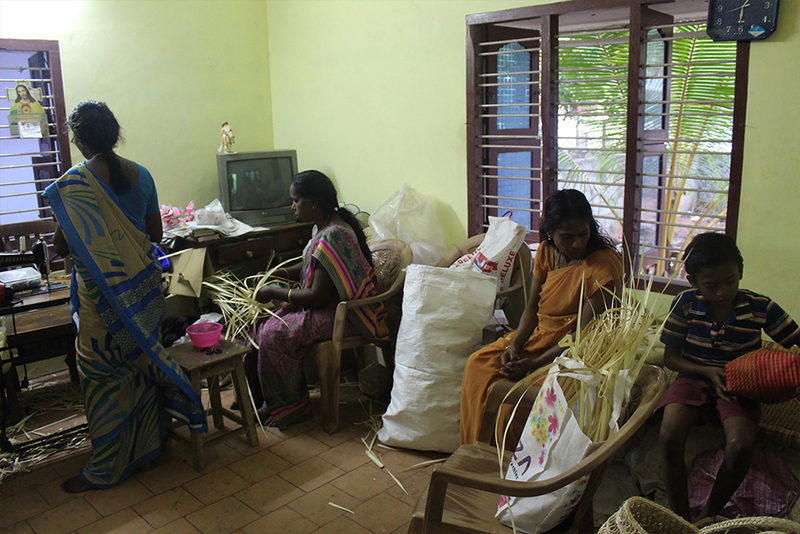 The artisans get training in planting of screw pine, collection of the leaves once in three months without harming the plant, management of raw material, dyeing using both eco-free and permitted dyes as well as organic dyes, stitching and splicing of the leaves, fumigating, packing etc. which makes them professionally competent to meet international demands. 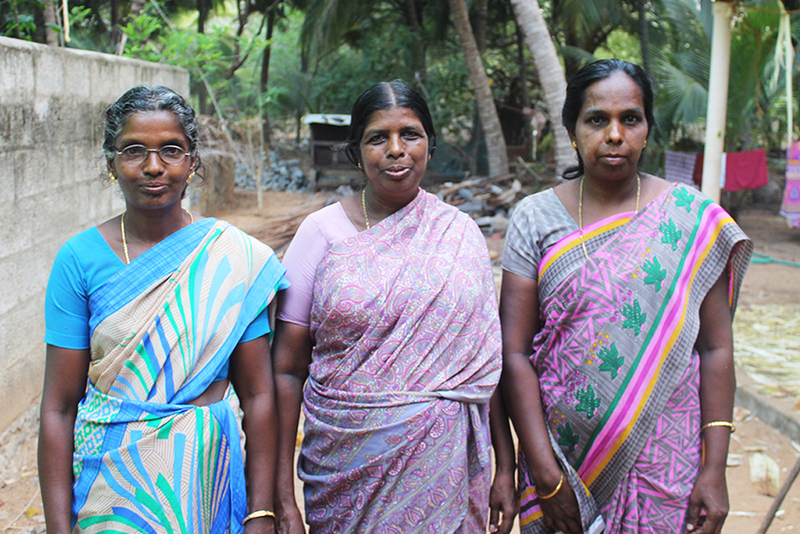 Kanyakumari is one such place where the screw pine craft can be found and many industries related to them can be seen. Kanyakumari also known as Cape Comorin is a district in the state of Tamil Nadu. It is the southernmost tip of Peninsular India. It is the meeting point of three oceans the Bay of Bengal, the Arabian Sea and the Indian Ocean. It is also the southern tip of Western Ghats range. Kanyakumari is a popular tourist destination and is been a town since Sangam period. Kanyakumari is been mentioned in the ancient Greek book, the Perplus of Erythraean Sea, which has the sailing directions from Red sea to Indus and Malabar. Ptolemy’s geography describes commercial relations between western India and Alexandria. Kanyakumari was a center for great trade and commerce. Various kings like The Cholas, The Cheras, The Pandyas and The Nayaks ruled it. Kanyakumari is one of the popular tourist attractions in the south. Kanyakumari gets its name from the Devi Kanya Kumari, considered to be the sister of Krishna. The goddess is believed to be one who removes the rigidity of our mind. The temple here is a Sakthi Peetha. The place was also known as kanyashram of the Baalaamika, the deity of the temple. This is one of the temples in India where Devi is worshipped as a child. The rites and rituals are done in Kerala Namboothiri method. The temple is very old and mentioned in ancient Sanskrit literature. 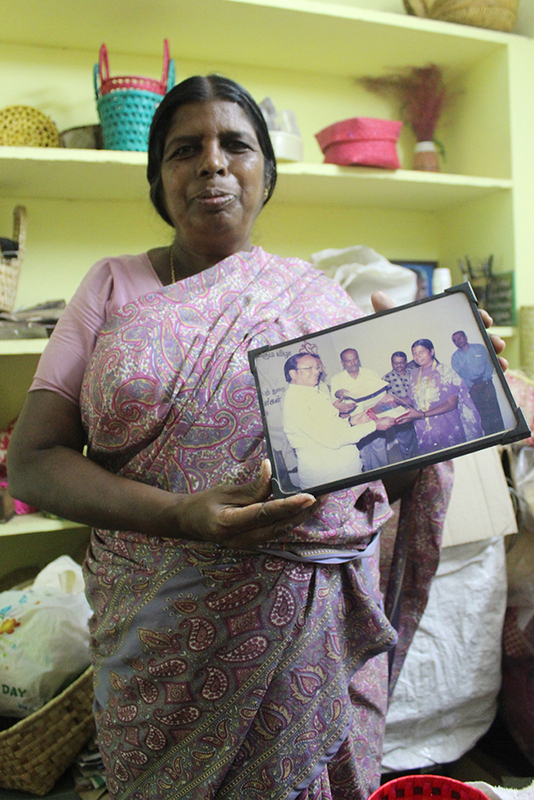 M/s Thangajyothi a State awardee from kanyakumari district is doing crafts out of screw pine leaves for the last four decades. Now let us see how it is been done.